Computer Application Services (CAS) became employee owned in January 2014, shortly after Ken took over as Chief Executive. He explained to the audience how employee ownership had offered an exit route to CAS’s previous management who were looking to retire, while giving employees an opportunity to develop and own a slice of the business. That slice could be bigger still when Ken and chairman, Ian Ritchie, themselves exit the business in due course. CAS, the company that developed Workpro, is now poised to apply for investment to accelerate growth and reach out to new markets. 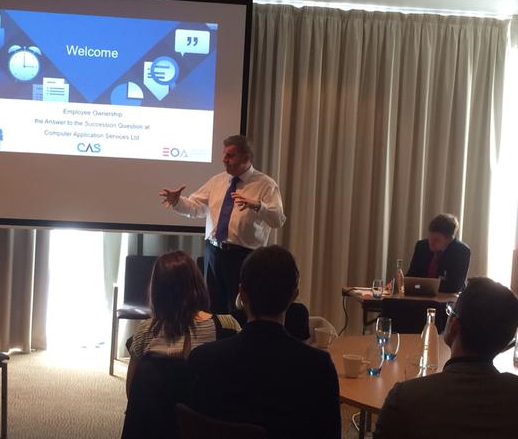 “Doing this talk for other businesses considering Employee Ownership proved to be a great exercise in taking stock of how far team CAS has come, and where we are heading,” says Ken, pictured. Employee Ownership- The Journey so far!